There are primarily three hydrodynamic models that produce tidal/storm surge forecast guidance for the Delaware Bay region. These systems run operationally several times per day and output hourly predictions on hydrologic parameters, such as water levels, temperature, and winds. Each model is listed below with links for more information. The National Weather Service (NWS) runs an operational extratropical storm surge model called ET-SURGE (also known as the ETSS model.) This model was developed by the NWS’s Meteorological Development Laboratory (MDL) and is a variation on the NWS’s Sea, Lake and Overland Surges from Hurricanes (SLOSH) model. ET Surge runs operationally four times daily out to 96 hours at a relatively coarse spatial resolution. Station forecasts are used by NWS and other organizations. ET-SURGE should be considered as model guidance only and not be used for tropical systems. Real-time observations are also available for wind and other variables. 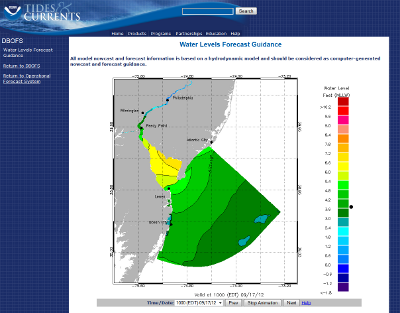 NOAA runs the Delaware Bay Operational Forecast System (DBOFS) specifically for the Delaware Bay and surrouding region. New model runs are performed every 6 hours for water levels, wind, salinity, currents, and temperature. Forecasts are made for each hour out to 48 hrs in advance. The spatial resolution of the DBOFS model various from 100 meters (near the upper Delaware River) to 3 km (in the near-shore Atlantic Ocean.) DBOFS assimilates data into a nowcast product that it uses as the initial condition for the forecast products. DBOFS should be considered as model guidance only. The Extratropical Surge and Tide Operational Forecast System (ESTOFS) is the next generation ET-Surge model. It is a collaboration between the NOAA/NOS/Coast Survey Develompment Lab and NOAA/NCEP. ESTOFS provides a second operational set of forecast guidance in addition to the ET-SURGE (ETSS) model with an increased resolution (2.5 km vs. 5 km for ET_SURGE) and uses the circulation model ADCIRC. Tides are included in ESTOFS and forced at its boundaries from the OSU TPXO v6.2 tides and refined further within ADCIRC. The model is forced by real time output of winds and pressures from the NCEP Global Forecast System (GFS). ESTOFS should be considered as model guidance only and not be used for tropical systems.